. 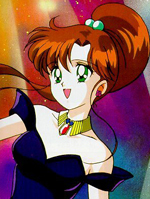 : Lunar Palace v.5 - Japanese: Sailor Jupiter :. Shimozaki is Makoto's childhood friend. He tries to save Makoto from the lion cardian and in the process he gets hurt. He needs to have a blood transfusion and the hospital's blood supply is low. Since Makoto has the same blood type as Shinogaki she offers to donate her blood. Also in her time of distress Shinogaki was there. This isn't the original gif image, I took the .AVI and turned it into a .GIF.